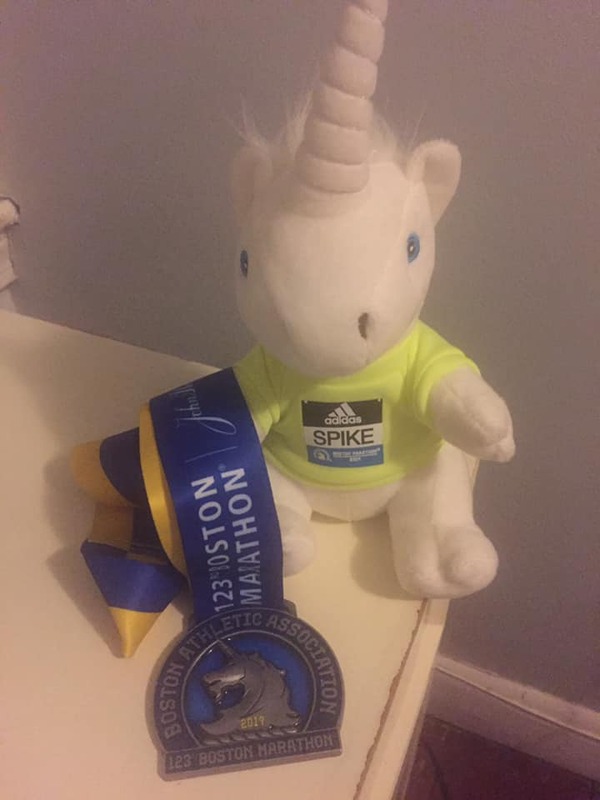 I’m writing at about midnight in Boston, MA, when the throbbing pain in the first black toenail of my running career has become too much to ignore. I’ll spare you all the pictures! Now I’ve had a couple of hours sleep, I’ve realised I actually really enjoyed about 80% of the experience of this race, and I’m so so glad that I came to find out what it was all about. Just being in Boston in marathon weekend is an experience in itself - the whole city getting behind the race in a way I’ve never encountered elsewhere. I woke up on race morning excited and nervy - I knew I was in great shape to run a strong race if I could just avoid being taken down by the twin perils of the weather and the Boston course itself. More on both later. I took the bus into central Boston at 6am to check my gear onto a yellow school bus, having spent about two hours the night before meticulously separating out what I would want after the race from the small bag you are allowed to take along to the start. Thanks Kieran for making sure I knew not to take my post-race gear to Hopkinton! As I was walking to gear check, the first batch of apocalyptic weather arrived - buckets of water falling out of the sky along with thunder and lightning rumbling around. I had felt well prepared, with a full set of clothes to throw away at the start, as well as old shoes and socks on my feet. (It all gets collected up and donated to charity). My binbag for waterproofing, though, was woefully inadequate, and I found myself with major poncho envy, as well as admiration for the smart souls who had duct taped plastic bags over their feet. By the time I reached my second yellow bus, the one that would carry us out to the race start in Hopkinton, I was pretty much soaked to the skin all over. Seventy minutes in a school bus with sixty other similarly drenched athletes was not the best part of the day! I was glad though that we weren’t enduring the freezing temperatures of 2018, and I have so much respect for those who somehow managed to complete the race in those conditions. The journey out to Hopkinton was uneventful, largely because our bus windows were so steamed up that we couldn’t see anything of it. I met a friendly chap from Chorlton who then quizzed me quite intensely on my race prep, and who I was impressed to learn was aiming for a 2:35. We disembarked to find the athlete village already a sea of mud, and I paid my first visit to a ‘portapotty’ before finding a spot to sit down on my bin bag in one of the large tents provided. I was also thrilled to discover hot coffee on tap, although rationed myself strictly to half a cup. After about a 45 minute ‘relax’ on the ground, I went for my second ‘potty’ trip, and then changed over my shoes and discarded my tracksuit on the way down to the start. The rain had largely stopped by this point, so although my feet were pretty wrinkly from being in soaked shoes for a couple of hours, I was hopeful that I’d avoid too much damage along the way. It was starting to feel pretty humid, giving the first clue as to the state of the weather later in the day. Aside from that, we started off with perfect running conditions - cool, dry, good cloud cover and a perfectly sized tailwind. A quick jog down to the start line, where we were efficiently sorted into corrals, and we were off. I was in the second wave, starting at 10.25am, and it only took a couple of minutes to get over the line. The first fifteen miles were a dream race. I was aware that the gradient was more downhill than is ideal, but felt I was controlling the pace pretty well, and the kilometres ticked off at bang-on goal pace. I felt strong and happy, was enjoying the atmosphere (shouting along to Sweet Caroline with a load of Red Sox fans sends tingles down the spine! ), and even started to let myself think that I might be able to maintain the pace. Famous last thoughts. Pretty much simultaneously, I got a stitch, and the sun came out. The pain in my abs moved around a bit, came and went, and I kept thinking I’d successfully run through it. It wasn’t to be, though, and I think it was around the 28-29k mark that my pace slowed dramatically, with a band of pain wrapped all the way around my stomach and back. I didn’t quite realise at the time just how hot it was getting, but the vivid sunburn I’m now in possession of tells the tale! I was apparently only feet away from Angela at mile 17, dressed in a bright yellow rain jacket, shouting my name and ringing a cowbell like crazy, but completely failed to see her. By mile 21 it was all over. I was walking through the water stations, liquid sloshing around in my stomach as it shut down (something I’ve suffered before in hot races). The only thing keeping me moving forward was the thought that if I didn’t cross the line, I wouldn’t be able to call myself a Boston Marathoner, and more importantly, wouldn’t get to wear my medal and finishers jacket with pride! I avoided medical stations like the plague, fearful that if I accidentally stopped at one I wouldn’t be allowed to continue. I also suddenly started to feel the wobbly quads everyone warns of - all the downhill taking its toll. My strava record says the elevation overall was 277m climbed - it certainly didn’t feel that much, but maybe I’ve forgotten some! Heartbreak Hill was in the end not too heartbreaking, as my race was over by then, and it was more like a jog up Park View Road. I should say a word here about the tracker. I had no intention at all of upsetting or offending anyone by hoping that I would be able to fly under the radar somewhat and avoid the live-action discussion of how my race was going! I think Allie put it best in saying that when you’re in the process of buggering up a marathon, the knowledge that all the people who have been willing you on can see just how badly it’s going can be enough to push you over the edge. But, I certainly didn’t mean to spoil anyone’s enjoyment in watching it, and I am overwhelmingly grateful for all of the Eagles support before, during and after - the club is 100% the reason I made it to Boston in the first place. 😍 you guys. A bit more staggering, and I made it to my gear and to Angela, waiting at the funnel exit. After collecting Mike (who was sporting an extra-large, extra-shiny six-star finisher medal; much kudos to him), we all lurched off together through more gusty winds and rain to hot showers and pizza. I’m still wobbling between disappointment and pride. I’m gutted that I couldn’t execute my race plan, but far better athletes than me were being bested all around me by the weather, and by the brutal Boston course. In the end (trying not to be too cheesy! ), I’m so proud just to have made it here, to run an iconic race, and to run in the footsteps of Bobbi Gibb and Kathrine Switzer, without whom none of us women would be racing any further than 800m.